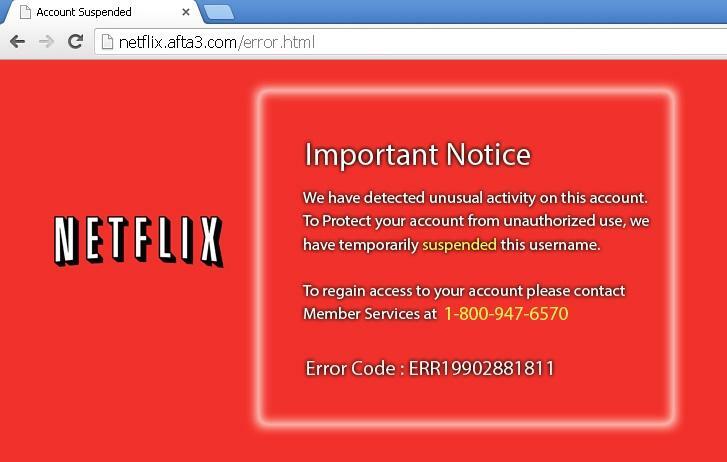 There's a particularly devious little Netflix scam floating around the Internet right now. One that attempts to manipulate users into letting scammers right in through the front door. Remember that "Microsoft" hustler that called us a few years back? This scam works a bit like that, but also uses Netflix as a way to encourage users to take action. That screenshot you see above? Hopefully you haven't seen it while trying to login to your account, because it's fake. The scam is initiated by a popup that appears when trying to login to Netflix, and tries to trick users into thinking their account has been jacked. If you happened to actually call the "Member Services" number—the one we tried was disconnected (surprise, surprise)—someone from support then explains that your Netflix account been hijacked by an overseas hacker. It gets worse. Via Jerome Segura of Malwarebytes Unpacked, a representative actually told him there was a hacker "inside his computer," and the only way to set things right was to download a series of security software. The scammers go to some pretty great lengths, and are obviously reading off a script to try and manipulate people into thinking hackers are inside their computers. At one point during Segura's call, he is actually forwarded directly to a "Microsoft Certified Technician," which is similar to our experience. Eventually, the scammers had the gumption to ask Segura to take a picture of his personal ID and credit card to pay for their services, at which point the call abruptly comes to an end. For a deeper and more technical explanation of what's going on, Segura recounts the entire experience on Unpacked. One would hope that someone wouldn't be tricked into actually thinking this is real, but it's still pretty clever. The endgame is clearly to get folks to pay for bogus services, and also the possibility of stealing someone's identity, which is why they asked for a picture of an ID card and credit card. For what it's worth, the call, according to Segura, originated in India.